When I think of San Francisco I always think of awesome seafood. I love fish and clam chowder and the restaurants at Pier 39 are some of the best on the waterfront. For Valentines or any special occasion Pier Market Restaurant is a great place to visit. They have one of the best views of the ocean and harbor that we have been to on Pier 39. We have been to over 3/4 of the restaurants they have on Pier 39 and this is one of my favorites. The view is beautiful and the food is delicious.The pictures I took of our lobsters and steak dinners were not good enough to truly show how divine they were. The pictures above are from the website and it looks just like it did on our plates. You can read the full menu on their website here. Our waitress was nice. She seemed a bit confused by my mother in law requesting certain things being and not being in her food. But my she has lupus so she has to watch what she eats. They were nice enough to bring my son french fries as soon as we ordered so he would stay seated, she must know its a kid trick in a restaurant to give them fries lol. We ordered the clam chowder for our appetizer and wow it was good. Perfect flavoring with the right amount of clams to potatoes ratio. My son even liked it and he can be picky about trying new things. The steaks were awesome. We ordered them well done and they were still full of flavor and juicy. For this occasion we went for my son's birthday. We let him open one of his presents at the dinner table. He thought it was great to be able to have good food and presents! A couple sitting across from us were also celebrating a birthday. When the husband saw our lobster dinner arrive at our table he quickly called over his waitress and upgraded he and his wife's dinner to what we were having. It was fun to see someone influenced by what we having enough to change their order to make the night extra special for his wife. I thought the restaurant knew is was my sons birthday but after dinner the bill came and not a cake I realized they had no clue lol. I wish I would have let them know since we watched the couple next to us get a birthday song and a piece of cake. My son LOVES cake and the attention of everyone singing to him. The management staff was super nice and made sure we had a good time and took home our leftovers. There wasn't much though, just my sons food. It was all way to good not to eat it right then and their. We really liked that Pier Market is family owned for over 30 years. Its a wonderful place to eat fresh seafood with a casual setting. Great for Valentines, Birthdays, Anniversaries and they will let you host an event there. The view is a huge reason I would like to go back there again. We went at night so we saw the harbor with all the lights lining the sky. 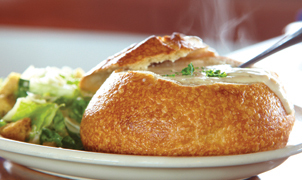 I would love to go for a lunch in the summer to be able to see the Golden Gate bridge while enjoy some more of the delicious clam chowder. *I was not paid for our review. The opinions are 100% mine and may vary from others. I was a guest of Pier Market Restaurant for my meal for my family from the PR company that represents them.